Ms. Shirley L. Beldia, ATI XII’s Organic Agriculture (OA) focal person on set the program together with City and Municipal agriculturist of the Region. TANTANGAN, South Cotabato. February 7, 2019. 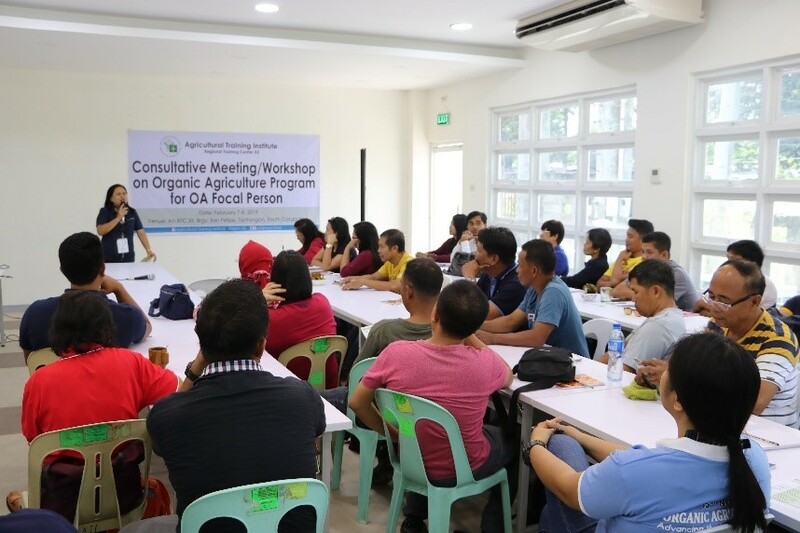 The Agricultural Training Institute XII (ATI-RTC XII) conducted a consultative meeting/ workshop on organic agriculture program for OA focal person on February 7 & 8, 2019 held at the ATI-XII’s new training hall in Tantangan. The invited attendees composed of 45 individuals coming from various cities and municipalities of the region. During the first day, the activity was focused on the 2018 accomplishment report/workshop and the future plans for 2019. In the afternoon, a team building activity was realized to enhance the collaboration between and among the Provincial and Municipal Local Government Units (LGUs) in the pursuit of such program. The last day was spent on visiting various ATI-XII-assisted Learning Sites (LS) with the intention to give the participants a better idea of how these LS’s are doing their homework. The group visited the following sites: OrganiKian Urban farm, Marvelous College of Technology, UMANI farm, Pheonix Larrel farm through the facilitation of Mr. Johnny H. Pasaquian, and Shirly L. Beldia of ATI-XII OA focal person. The ATI-RTC XII is the extension and training arm of the Philippine Department of Agriculture in SOCCSKSARGEN, Maguindanao, and Lanao del Sur, mandated to train agricultural extension workers and their beneficiaries and lead in the delivery of e-extension services for agriculture and fisheries.